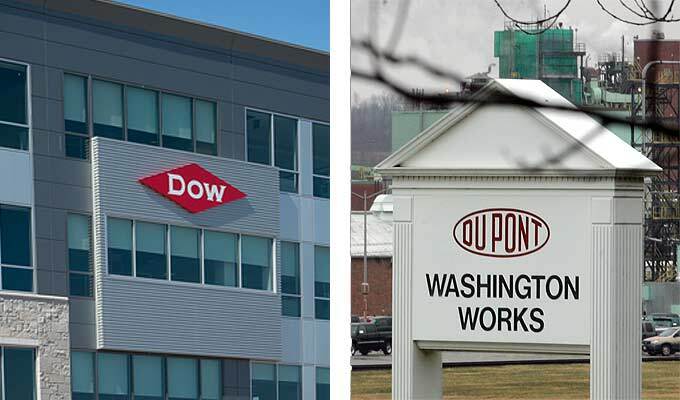 Dow Chemical and DuPont have announced a plan to merge, in a deal valuing them at $130 billion. The all-share deal will eventually lead to the merged company, initially to be called DowDuPont, being split in three. The three companies would focus on agriculture, materials and specialty products. If the merger is cleared by regulators, the new company will be owned equally by current Dow and DuPont shareholders. The chemical giants aim to achieve the split into three within two years of the completion of the merger. They hope to save $3 billion through cost-cutting during that period. Potential tax savings were one reason for the complicated merger-before-breakup deal, analysts said. At the same time, DuPont announced a cost-saving plan that will involve cutting about 10% of staff. Dow CEO Andrew Liveris will be executive chairman of the new company, while DuPont CEO Ed Breen will be the new chief executive. “This transaction is a game-changer for our industry and reflects the culmination of a vision we have had for more than a decade to bring together these two powerful innovation and material science leaders,” Andrew Liveris said. Shares in Dow Chemical closed down 2.8% in New York, while DuPont fell 5.5% on December 11. Dow also said that it would assume full control of its joint venture with glassmaker Corning.